Due to the new fatherhood, Rolf was unable to take Helena home from the Canary Islands. Therefore, in September 2013, Rolf handed Helena over to his trusted friends, Markus, Peter and Marga. This is of course not something to be taken lightly and 1 full week of briefings preceded the passage to Northern Europe. The following is the assembled triplog from the Canary Islands all the way to Brest, France, where Rolf, Baziel and Roel took over and brought Helena home, to Amsterdam in The Netherlands. Yes, Helena is back again! Moving towards home. Although the title of this message might be a bit optimistic. Our aim is to bring her back to northern Europe, but crew holidays are limited, as will be the boat speed, as we will mainly get headwinds on our journey. On board we have Marga. You all know her , as she so elegantly delivered Helena to Gran Canaria coming from South Africa. And now she is back on board, so the Afghan people will have to wait for their elections. Sorry ’bout that. Also on board there is Peter. If you look on the syhelena website in the crew section, you will find him. Peter has sailed Helena before, on the Atlantic crossing, during which he has become famous for cooking impossible meals whenever challenged. You bet we have plans for him!. And finally, there’s Markus, today’s author. Also known from the Atlantic crossing. Certainly not because of my cooking skills. On the Atlantic I limited myself mainly to washing the dishes, together with Baziel. Oops! You may notice something is missing! Or rather: someONE is missing. The usual host of this daily entertainment is not on the ship! After a couple of days of preparing and briefing Rolf has decided that he’d rather stay with Abel. There was a short mutiny and now I have announced myself to be the new captain. That’ll teach him! We are going anyway. Basically we will start in a NNW direction towards the Azores, beating against the NNE winds that are usual around here. After a couple of days we will probably have to pass some very light winds and then hopefully pick up the side or tail of a depression to blow us to England. A lot is depending on the speed we can make, so England may be too challenging. Then we will have to settle for France or even Northern Spain. Anyway, you will be hearing from us and the progress we make. Aaaaand we’re off. Although Peter turned ill yesterday and Marga an I also had weak tummies, we finished our to do list, took a nap and decided to set sail. By now everybody is feeling fine. A bit slow may be and I am – as could be expected – fighting seasickness. With limited success so far. Today we started with a somewhat unusual NW wind, so we left on SB bow, now waiting for the wind to change, so we can tack to our planned Port bow towards Azores. The sun has set by now, the moon is blinking on the ocean, which is stiil very friendly to us. Relatively flat, even. The ocean still is treating us gently. That’s kind, as all our tummies are still a bit iffy. Tonight we tacked to Port bow, which we will probably continue for a few days. Not much wind, so the engine is helping constantly. Actually the engine is the only one really working, as the three of us are quite lazy and sleepy so far. Even during daytime. Marga made us a fine risotto yesterday and today we ate Sjoerts (my son) favorite oven dish prepared by Peter. Only the broccoli was missing. Obviously Peter made enough for two more days or six more crew. During the night we took away the sails, as the wind completely stopped. Just a reefed mizzen for stability. This morning the wind picked up again, from a good angle, so we decided to sail for a bit. As soon as we switched of the engine (oh that’s nice and quite…) the wind completely stopped again within a minute. We decided to use the time for our engine room checks. Then we pickud up the motorsailing again. Winds remain light (4-14 knots), so we need the engine to push us over the waves. During the night we had the full moon giving so much light, that even some clouds were not making it dark. Early in the morning we had some rain showers, but the afternoon was nice and sunny again. Waves are a bit higher than before, but Helena is still handling them gently. Dolphins!!! Peter was complaining about the lack of sea life yesterday, but this afternoon we had a large number of dolphins coming to check us out. Not very large dolphins, but jumping spectacularly. Last evening Madeira put itself in our way. We politely asked it to step aside and make way, but it completely ignored our calls. So we had to tack to SB bow for a few hours and then tack back. Then around midnight the wind picked up and we could actually get to some sailing. Wind is very variable since. During the night it sometimes went up to 20 knots in order to drop back to 4 knots. Coming from all directions between N and E. Since this morning we have been sailing and motorsailing depending on conditions. It appears that we have to choose between clouds+wind and sun+calm. We put Marga in charge of the election and it turned out we chose wind over sun unanimously…… So we got the sun. So far for democracy. Passing Madeira we had the opportunity this morning to get in touch with our fiends and family and update our facebook status to “bearded” (Only Peter and Markus of course). For lunch Marga prepared some reeeaaaaly nice quesadillas and for diner we got the famous polish meatballs we were so much looking forward to. This time diner was a joint effort of Peter and Marga. I am the luckiest captain ever! Also today we experienced the anti-cloud forcefield Rolf had been talking about. Big showers coming towards us and vanishing in sight of Helena. She’s a magic lady! It looks like our plan is going to change. A depression around the Azores is pretty unstable. Trying to pick it up might be a risky one. Even if it would get our speed up to a 7 knot average, the extra miles to stay in it would probably make us run out of time. On the east side of the Azores there will be an area of light Easterly winds. We may want to stay in that area and head for La Coruna. That would mean a lot more motoring, but then we also calculated that we have more diesel to burn than days to do it. We ‘ll keep you informed on how we proceed. A bit more than 140 caracters, but then hey! : we only send one tweet each day! Wheather forecasts for the ocean appear to be just as poor as the ones at home. What should have been a nice and easy night (like the ones before) became a pretty tough beating for Helena and her crew. During the night and early morning a large number of squalls hit us. Wind gusts with up to 28 knots came over and waves became very steep. As the wind was very low in between we motor-sailed through the night. Keeping speed up whenever wind was at 6-10 knots. Throttle down, when speed became too high becaus of the wind. Nobody got much sleep and Marga’s coiffure was really messed up by the morning. She took the hardest part, though. Because the boat was rocking so hard, Peter could not sleep in the bow cabin, so he cuddled in with me. 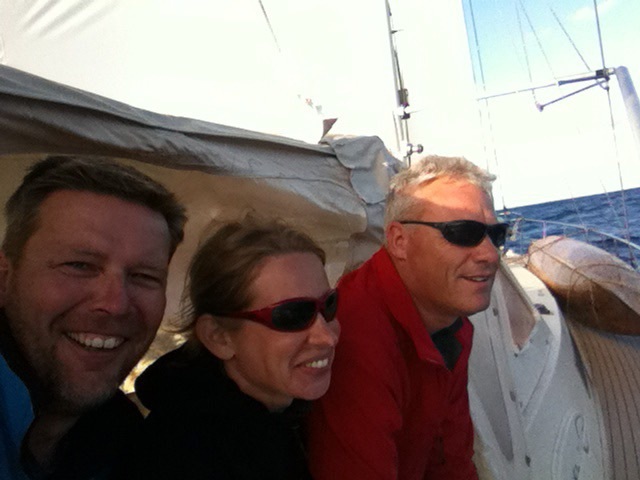 Today we have been sailing close hauled most of the time in about 16-20 knots of wind. A bit bumpy, but doable. We don’t know what to anticipate for during the night. Gribfiles promise a quite night again, but we also see clouds building up. Probably we wil reef sails for the worst and use the engine to regulate speed. Forecast now position the depresseion a bit more coming our way, so we might be able to pick it up after all, even on our way towards Northern Spain. We had a nice, quite and eventless night. All precautions were taken, so nothing happened. Various shades of grey during the morning. Sea is flattening and the inboard Japanese guy is humming quietly at 1800 RPM to support the sails and ensure progress. A wonderful sunny afternoon. Still nice and warm, although the nights ar becoming a bit more chilly. Being away at sea for a couple of days without being distracted by various stimuli like email, facebook, twitter, newspaper etc. is actually very nice and pleasant. The brain can process for a while, thoughts can build up. Time to read and think (between the daily routine checks, of course, Rolf). There is, however, a downside to this. Any questions that the three of us cannot resolve, we don’t seem to be able to google the answer. Or find it on Wiki for that matter. And all the things that could have happened while we are out here, of which we are not aware… Has POTUS and commander in chief Obama startet bombing Syria yet? We don’t know. Did government finally discover that lowering taxes would actually benefit the economy? We don’t think so. Is there finally hope for World Peace, because the Palestinian conflict has been resolved? Probably. Did someone come up with a cure for cancer. Why not? We have been away long enough!. So you see, we are building up quite some expectations for buying a newspaper as soon as we hit land somewhere. There’d better not be the same old @#$%^& in them as when we left! Slowly the wind is turning a bit more East and we are on a N-NE-course now. This will continue, until we steer towards land again. We will have to be quick enough to stay a bit ahead of the centre of a depression. Furtheron we might get more wind from that, but also rain. So for now we’re enjoying the sun to the max! On today’s menu was spaghetti Bolognese di Piedro. Peter – again – did not disappoint in any way. Looking forward to a relatively calm night. We had a really beautiful sunny and warm day until 5 PM. The Happy Hour (or Oorlam if you like) was sort of a picknick on the sundeck. Then the clouds started closing in. We are looking forward to some less stable weather, with rain and possible strong wind. So we’re all set up for that. We are on a North-East course now, that should get us close to La Coruna. Once we get there, we will decide whether we stop there, or if there is enough time (and reasonable weather) to carry on to Northern France. Brest would be a suitable goal then. Looking forward to a restless, cold and rainy night…. Don’t worry, we were all so lazy during recent days that sleep cannot possibly be an issue. We think of putting the hot tub back on the sundeck, that will keep us warm in chilly nights. Rolf can we use the dive compressor for making a bubble bath out of it? On the menu tonight is nasi goreng, but we were a bit late defrosting the chicken, so we’ll be eating late. We had an interesting night and day. The Southerly wind step by step increased during the night and early morning to about 25-30 knots. We reefed in time, but it gave us nice progress nevertheless, starting the night at 6-7 knots and ending it at 7-8 knots on average. The night was still lightened by the moon and stars and the rain only arrived during the morning. The waves during the night were not high, but were only shaking us heavily. During the morning the waves got higher and longer, rolling under Helena more gently, occasionally pushing her to 9 or even 10 knots. Great! We were quite amazed that on this big wide open ocean the wind can still go around a corner! When the rain front came over us, first the SE wind increased to 30 to 35 knots and gusts upto 45, then suddenly within one minute mad a 120 degree turn to West at 10-15 knots. Thanks Rolf, for the heads-up. Now we are in light wind again, running on engine, but with high waves from behind, rolling Helena from side to side. Not very nice. The rain only lasted for a few hours, but there will probably be more. Diner last night was home made nasi goreng with home made peanutbuttersauce and home made pisang goreng and kroepoek. Today’s lunch was home made leftovers of last nights diner. We’ll be frying an egg for now, that should get us through the night. This morning we woke up to a beautiful sunrise, starting a calm and sunny day. A large, gentle swell rolling slowly under Helena. Not much wind, but hey! we’re not complaining. During the afternoon the wind picked up, the engine was stopped and we did some great ocean sailing, like it’s supposed to be: sunny, a large slow swell, wind from the stern, a nice (but not spectacular) speed. This we could manage for another couple of weeks…. At 5 PM we opened up a nice South African sauvignon blanc and looked at some pictures of the 2009 Atlantic crossing. Catching up stories of Peter up in the mast, making French fries, kroketten and bitterballen and applepie. Spending hours sitting on the bow with the feet in the water, diving at Barbados. Helena back then not as impressive as she is now. We are looking forward to a night of sailing. The wind will increase a bit, but all very manageable. We start to feel that we are getting into more northerly latitudes, though, as it is getting a bit chilly. Tomorrow we will sail past La Coruna and move into Biscay. Goal is set for Brittay; Brest. Hopefully we will be there on Friday evening. Might be Saturday morning, though. The ocean is kind to us. We were able to sail most of the night, just a few hours of engine to keep the speed up when the wind dropped a bit and to charge the batteries as well. During the day we could keep sailing in 15-20 knots of wind. MAgnificent! The wind is SSE making smaller waves and there is a large SW swell as well, so we keep on rolling…..
For the past days we rarely saw other ships. It could take 10-20 hours before one would appear on the screen. Most of the ships we get on AIS we cannot even see. This morning however there suddenly were dozens of them. It seems we’re close to the line between the English Channel and the traffice zone at Finistere (Spain). So all ships beween Northern Europa and the Mediterranean, Suez, West Africa are passing here. Whales!!!! Just before lunch we were slowly overtaken by a couple (3 or 4)of whales! First one hears them, then you see them. Light shades in the waves, sometimes rising to be seen and breathing. They only surfaced a few times, but what a great sight! We think it were Humbbackwales, due to the big …. on their backs. Yes, fins we meen. This evening we got our japanese style steak diner later than expected, as we had many more whales passing us for over an hour. Later, even during diner, they kept showing up. We wondered why they were traveling in the same area as all the big ships. This afternoon it became a bit chilly again, so Marga took a blanket into the cockpit. She claimed to look like grandma with that, so we suggested to take on knitting now. Now would also be the right time to tell you that we (as in: Peter) have been fishing now for a number of days. And quite succesfully, I might add. The catching, however, has yet to begin. So the tuna for the pizza came out of a can, I’m afraid. As you can see from our position we are now well into Biscay. Still nicely sailing with 15 to 20 knots of tailwind. The wind will probably slow in coming hours, so we will need some engine as well to get to Brittany. We now discussed with Rolf not to sail into Brest, but to land in L’Aber Wrac’h (yes, that’s how it’s spelled. Nobody knows how it’s pronounced). We are not sure, but we believe that this translates to Wreck Harbour. It starts you wondering, doesn’t it? When an owner directs his crew to bring his yacht to wreck harbour…. During the night the light winds changes to the East, as was expected. Still light winds, so in order to maintain a reasonable speed, the engine has been quietly running since last night. We are still close to all the large ships, but they keep clear from us. This morning we were overtaken by the MS Rotterdam, the passenger ship of the HAL – Holland Amerika Lijn – that some of our friends and family have been on. A very short dolphin visit (about 5) this morning, but they did not stay for longer than a few minutes. This afternoon we were able to use the Easterly winds for a few hours to do some nice sailing. In 10-12 knots of wind we were able to take the lady up to 7+ knots of speed at a 45-50 degree angle. Which was really nice, as we expected to be motoring today. Yesterday’s mocking of our fishing successes had an unexpected effect. Today Peter actually caught a nice tuna. So the steaks are back in the fridge; today we has sushi for starters and tuna steak as main course! And Rolf, there will be tuna in the freezer as well for you. This evening, about 4 years after departure, Helena sailed back onto the continent again. The rise of the sea bottom from 4km to about 100-200m now (the depth instrument is finally giving numbers again) is what makes Biscay so dangerous and feared. And we survived!! Yes we have arrived in L’aber Wrac’h. After a night that was partially spent in the engine room, this morning during breakfast we were entered. As pirates are no longer active in the Brest area, we had to assume these were customs officers. Or douane, as the French call it. Four men in a RIB, launched by a large ship, came to us and three of them came on board. They checked ships papers, pasports, owner, previous ports and destination and they searched the ship. Not very thorough, but in the end they were on board for about an hour. As French officials go, these were relatively friendly. Tonight is this crew’s goodbye. We are a bit sad, but duty is calling, so tomorrow we will have to leave this fine ship. She has taken very good care of us and with confidence we can hand her over to Rolf, who is coming on board to bring her back into NL by his own hands. That must be nice!